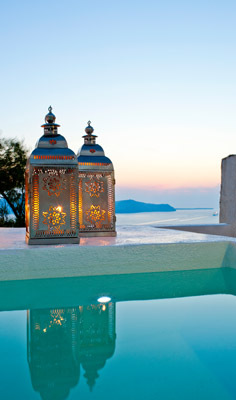 Asteras Villas Santorini, Luxury Santorini Hotel. 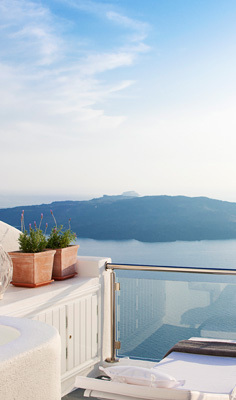 Atop the majestic Caldera cliffs, looking down towards the endless Aegean Blue and just a few steps away of the main pebbled street in Fira, the capital city of the magical island of Santorini, dreams and luxury meet reality in an exclusive and magnificent way. Five suites “Dressed Up” in golden, white and black, all set ready to entertain you, to offer you days of delight and moments of indulgence that you will always cherish! Phoebe, Venus, Galatea, Astrophelia, La Luna. All with imposing doorways, ample interiors and shady private terraces from where the magical and so famous sunsets can be enjoyed, capture the essence of old that is brought up to date with tasteful fashionable and chic touches! 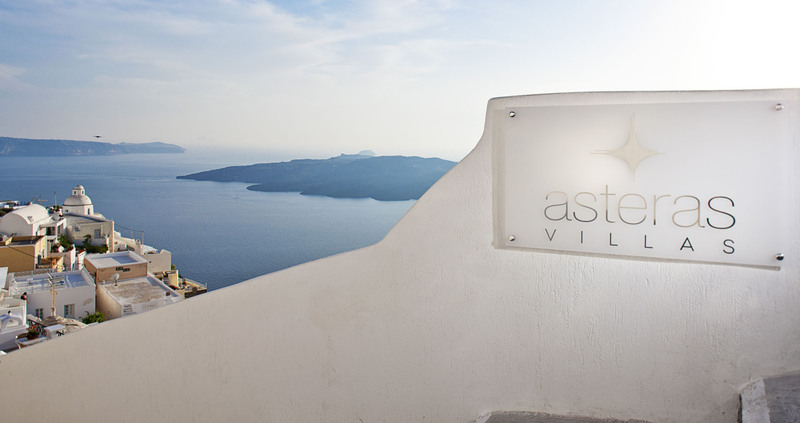 Each suite offers to the distinctive guest breathtaking views to the Caldera, Thirassia Island, the famous volcano and the traditional village of Oia. 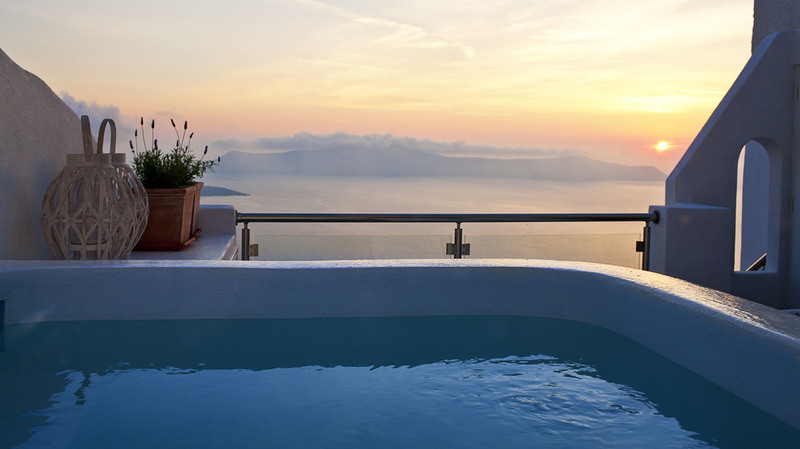 The overlook from the suites is stunning; the eye continues its endless traveling above blue and the daylight surrenders to the twilight glow. The sun dives to the tranquil golden-blue horizon-line offering ungrudgingly a dramatic breathtaking scenery. 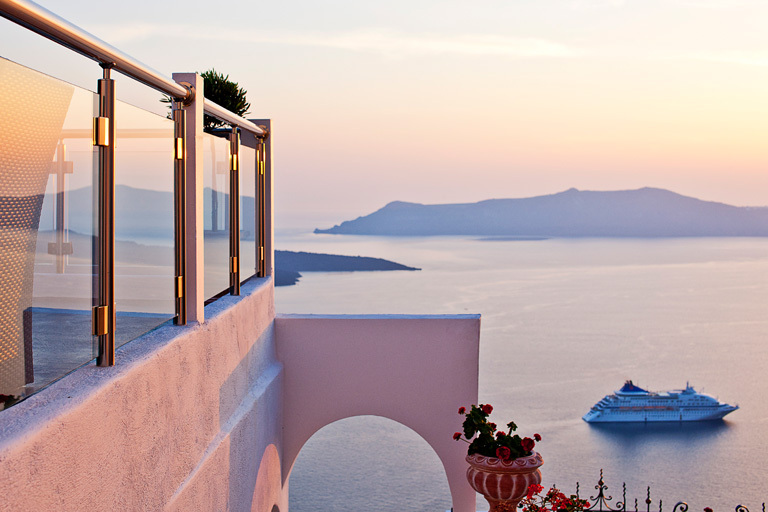 Nothing compares to the sunset from the Caldera of Santorini; probably the most romantic and definitely the most photographed sunset on earth. Whether you prefer to watch the Eclipse or you are willing to experience the Equinox or even enjoy being under the Midnight Sun or the Blue Moon, we are offering you four different packages that will add value to your precious Honeymoon vacations or make your oath renewals an unforgettable romantic experience. Soothe your mind, body and soul with unparalleled massage therapies, available on request. Our experienced therapists, will remove the knots from your neck with a selection of massages and will put a spring in your step with relaxing therapies.